The Bacterial Viability and Gram Stain Kit contains three dyes (CF®488A WGA, DAPI and EthD-III) for distinguishing between gram-negative and gram-positive, as well as live versus dead bacteria. CF®488A-labeled wheat germ agglutinin (WGA) stains the N-acetylglucosamine of the peptidoglycan layer of gram-positive bacteria with green fluorescence. Ethidium Homodimer III (EthD-III) is a nucleic acid binding dye that is membrane impermeable, which selectively stains cells with compromised plasma membranes with red fluorescence. All cells stain blue with the membrane permeable DNA dye DAPI. One kit is sufficient for 200 assays when used according to the kit protocol. The Bacterial Viability and Gram Stain Kit has been tested on the following bacterial species: Bacillus subtilis subsp. 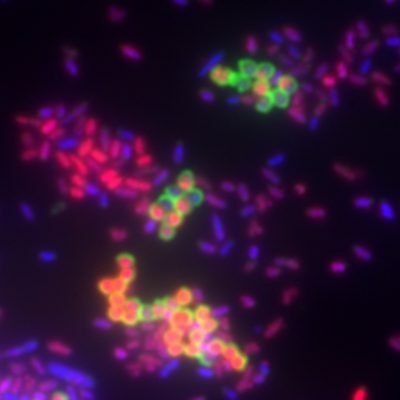 subtilis, Escherichia coli, Micrococcus luteus, Pseudomonas fluorescens, and Staphylococcus epidermidis. 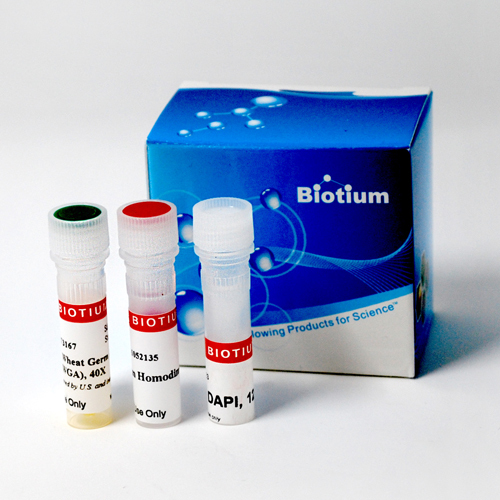 Live cell bacteria stains, suitable for flow cytometry or fluorescence microscopy. Stain live and dead, gram-positive and gram-negative bacteria with red or green fluorescence.